When discussing the waterways of Montana, it is important to include the internationally flavored, 538-mile long Milk River. It pulls its waters from the front range of the Rockies by way of three main tributaries, the North, Middle and South forks tumbling off the Hudson Bay Divide in Glacier National Park on the western perimeter of the Blackfeet Indian Nation. Initially, the Milk is a product of the confluence of the Middle and South forks directly north of Browning just below Canada. From this point, out in the middle of Blackfeet Reservation rangeland, it wiggles northeastward until it crosses the Canadian line, 47 miles after its start. In Canada, it picks up its North Fork. After experiencing 167 Canadian miles, the Milk returns stateside north of the Hi-Line town of Rudyard. Thirty miles later, it enters the long and narrow Fresno Reservoir just west of Havre. This basin greatly controls the tempo of the river from here down. After slipping out of its confinements, it meanders through Havre and follows U.S. Highway 2 eastward, continually switching from one side of the highway to the other. 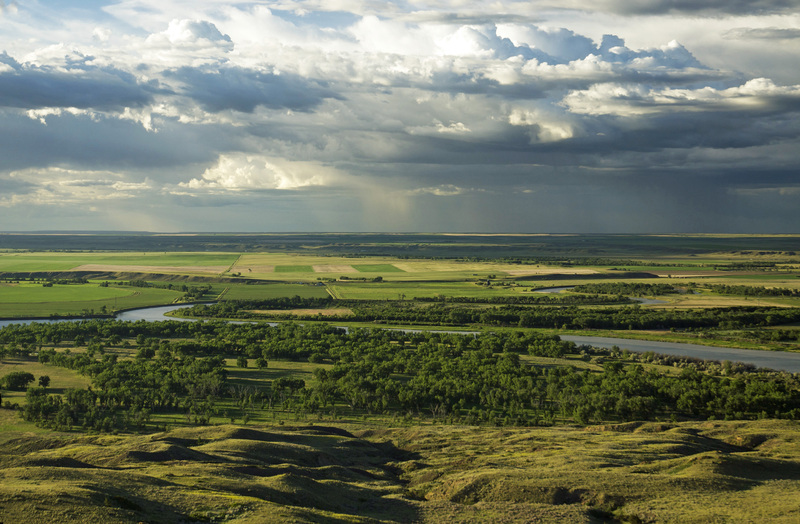 Though sluggish and brown-colored, the Milk River, through numerous diversion dams, provides much-needed irrigation on the northern Montana prairie. While the river itself lacks the splendor of some its peers, the prairie country it visits is quite beautiful. After Havre, the communities of Chinook, Harlem and Dodson get a glimpse of the waterway. Between Harlem and Dodson, on Highway 2, it forms the northern boundary of the Fort Belknap Indian Reservation, home to the Assinboine and Gros Ventre nations. Beyond Fort Belknap, the town of Malta cradles the river. At this ranching community, the Milk makes a short run to the north and then begins a southeastward direction, passing Hinsdale and Glasgow on its way to the Missouri River, just down from the Fort Peck Dam. As the waters of the Missouri are flowing clean through the spillways of Fork Peck, the muddiness of the Milk provides a very distinct contrast where they meet. Lewis and Clark make mention of the Milk in their journals. It was one of the landmarks the Hidatsa Indians had told them to look for on their way west. The Indians called the Milk “the River that scolds all others.” On May 8, 1805, Meriwether Lewis noted “… the water of this river posseses a peculiar whiteness, being about the colour of a cup of tea with the admixture of a tabelspoonfull of milk. from the colour of it’s water we called it Milk river. we think it possible that this may be the river called by the Minitares (Hidatsa) ‘the river that scolds at all others’…” Lewis also noted the Milk River Hills that rise almost 700 feet above the floodplain of the Milk and Missouri.